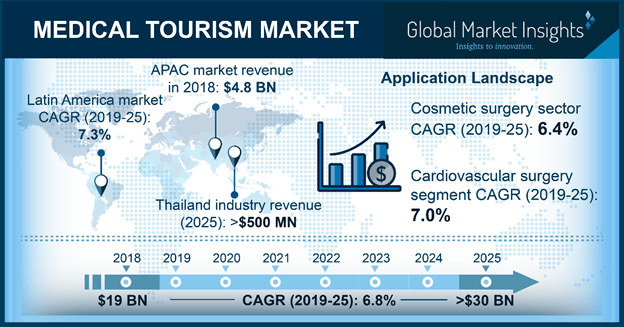 Medical Tourism Market size is set to reach USD 29 billion by 2024; according to a new research report by Global Market Insights. Growing compliance to international standards for medical treatments in developing countries will spur growth of medical tourism market in upcoming years. According to a study published by Fraser Institute, around 63 thousand Canadian citizens traveled abroad for availing medical treatments. Major reason for seeking medical treatment abroad was increasing compliance of medical treatments with international standards. Currently, there are more than 450 Joint Commission International (JCI) accredited hospitals around the world. This will lead to increasing inclination of patients towards medical treatments in foreign countries. Availability of high-quality medical treatment procedures in developing countries is the one of the major factors driving medical tourism market. For instance, success rate of open heart surgery in India in around 98%, that is the highest in whole of Asia Pacific region. Also, rising focus of major public and private hospitals towards offering medical treatments of quality similar to those in developed nations such as U.S. and UK will spur medical tourism market growth. Cosmetics surgery market accounted for largest revenue of USD 2,863.1 million in 2017. Number of people opting for cosmetic surgeries is increasing annually. This is attributable to rising influence of aesthetics among people. Also, with increasing geriatric population, the demand for face lift surgeries and hair restoration procedures will increase across the forecast timeframe. Canada medical tourism market will grow at 7.2% CAGR, owing to availability of cutting-edge and advanced medical treatments to patients. According to Medical Tourism Index, in 2016, Canada stood first among the top 5 destinations for seeking medical care. Canada healthcare system provides one of the highest quality of medical treatments across the globe. The overall Canadian environment, high quality of facilities and services offered are the major reasons for attracting medical tourists from the world. Well-established healthcare infrastructure and availability of rare medical treatments will drive medical tourism market growth in the future. Singapore medical tourism market occupied a significant share of 35.0% in 2017 owing to presence of highly skilled healthcare personnel and more than 20 internationally-accredited hospitals and specialty centers in the country. According to The Economist Intelligence Unit (EIU), in 2014, Singapore ranked 2nd worldwide for healthcare outcomes and efficient healthcare system. Well-established medical infrastructure and stable political environment are major factors propelling medical tourism market growth. Some of the prominent players involved in medical tourism market are Apollo Hospitals Enterprise Limited, Asklepios Kliniken GmbH & Co. KGaA, Fortis Healthcare Limited and Bumrungrad International Hospital. These firms adopt strategic initiatives including opening of new establishments, mergers and acquisitions, and geographical expansion. For instance, in October 2018, Apollo Cradle, Hyderabad announced launch of pediatric intensive care unit (PICU). This unit will be able to offer intensive care to critically ill children and round-the-clock care for special cases. This strategy will deliver new value for customers eventually increasing company’s brand image.